Starting a new spread is always exciting and a bit frightening. After all, it’s a blank page. The possibilities are limitless. How I start is up to me. My creative decision will lead to what it turns into. I usually start with some gesso. It helps to break the page. It lays the foundation and a little grit. It sets the tone for the spread. 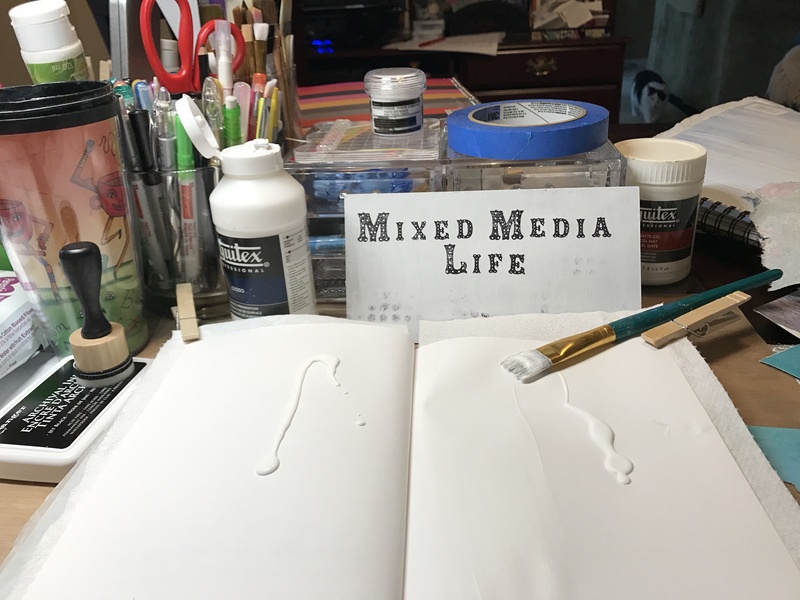 Dina Wakley refers to gesso as “underwear for your art.” If you start with gesso, it’s easier to touch up or move paint around. A blank page is similar to the start of a new day. My gesso is a little meditation and coffee. It helps to get my day going. It lays the foundation. The possibilities are limitless. What kind of day will I create? If something needs to be changed, I can start my day over at any time. This is my life. I like to call it my Mixed Media Life.